We’d love your help. Let us know what’s wrong with this preview of Forever Island and Allapattah by Patrick D. Smith. Forever Island is widely recognized as the classic novel of the Everglades.Allapattah is the story of a young Seminole in despair in the white man's world. To ask other readers questions about Forever Island and Allapattah, please sign up. I wish I knew how to write glowing summaries of what I read but that's not my gift. However, I have been emotionally changed after reading Patrick D Smith's tales of real Florida people. Forever Island and Allapattah are about how the white man took over land where Nattive Americans had lived for generations. The book is only about 200 pages but I wish it had been much longer. The writing is fairly simple but well worth reading. Although the plot and message of this book is good and relevant for our time, there are a lot of research and details missing in the narrative. It appears to have been written hurriedly towards a juvenile audience. Smith's other book, "A Land Remembered" is a much better read. Dark, sad, poignant, but an important witness to the drastic changes that Florida's ecology, and her people, have undergone in a few generations. Important reading, compelling, but not a happy-go-lucky summer vacation read. Two sad stories of the treatment of the Seminole Indians and the indifference and greed of those that exploited and ruined the ecosystem known as the Everglades. Published in 1987, this edition is actually two books, Forever Island, published in 1973, and Allapattah, published in 1987. The book was recommended by a friend who is a lover of the outdoors and can relate even though his perspective is from 50 years ago and north Florida. North Florida has its own 'growth and progress' story but not as stunning as south Florida, although some would argue that point. My bet is that it's a must read for budding environmentalists and those interested in Florida Published in 1987, this edition is actually two books, Forever Island, published in 1973, and Allapattah, published in 1987. My bet is that it's a must read for budding environmentalists and those interested in Florida history. Both books center on Seminoles families, the gradual loss of the Everglades where they used the land for their food, clothes and shelter. Their loss, of course, was due to the encroachment of land developers in south Florida. The main theme of the books can be summed up by Toby Tiger the main character from Allapattah who said "Soon it will all be ended, and there will be no more. The white men destroy all that they touch." As a native of north Florida, I've haven't seen the dire results as close hand as native south Floridians, but if there is any question of the damage done, just Google Earth. There is picture proof of the harm done to this once pristine area; encroachment by civilization for the sake of progress. Now we know, too late, the "River of Grass" is an imporant part of much needed water for all of Florida. All for, in a word, greed. Smith wrote in a very easy and simple manner to tell his point of view. He has lovely descriptions of the landscape and the bond the Seminoles had with Mother Earth and all its animals. Well worth the time spent in reading these two books. So sad, the results of encroachment and the books. Sad stories both. Years after reading this book, I still remember Charlie Jumper. I got choked up when he put the gourd rattle in Gumbo's small coffin and left crawfish at Gumbo's grave deep in the swamp at the ancient burial ground of his tribe. I do not think I could have done what he did to Little George. I'd have searched for another way to save the old gator. Wow, these are two good stories - but very sad. And frustrating. And infuriating (on hunters that would just shoot something because they can, and leave it to die; on officers who don't listen). Patrick Smith is a 1999 inductee into the Florida Artists Hall of Fame, the highest and most prestigious cultural honor that can be bestowed upon an individual by the State of Florida. In May 2002 Smith was the recipient of the Florida Historical Society’s Fay Schweim Award as the “Greatest Living Floridian.” The one-time-only award was established to honor the one individual who has contributed th Patrick Smith is a 1999 inductee into the Florida Artists Hall of Fame, the highest and most prestigious cultural honor that can be bestowed upon an individual by the State of Florida. In May 2002 Smith was the recipient of the Florida Historical Society’s Fay Schweim Award as the “Greatest Living Floridian.” The one-time-only award was established to honor the one individual who has contributed the most to Florida in recent history. Smith was cited for the impact his novels have made on Floridians, both natives and newcomers to the state, and for the worldwide acclaim he has received. 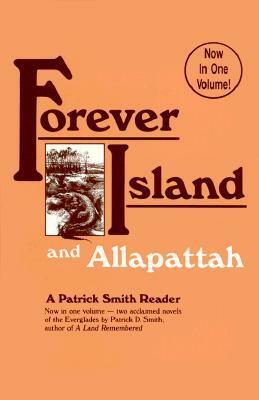 Smith has been nominated three times for the Pulitzer Prize, in 1973 for Forever Island, which was a 1974 selection of the Reader’s Digest Condensed Book Club and has been published in 46 countries; in 1978 for Angel City, which was produced as a “Movie of the Week” for the CBS television network and has aired worldwide; and in 1984 for A Land Remembered, which was an Editors’ Choice selection of the New York Times Book Review. In the 2001 The Best of Florida statewide poll taken by Florida Monthly magazine, A Land Remembered was ranked #1 Best Florida Book. The novel also ranked #1 in all the polls since then. Smith’s lifetime work was nominated for the 1985 Nobel Prize for Literature, and since then he has received five additional nominations. In 2008 he was honored with a Literary Heritage Award at the 1st Annual Heritage Book Festival in St Augustine. FLorida's Secretary of State Kurt Browning presented the award. In 1995 Patrick Smith was elected by The Southern Academy of Letters, Arts and Science for its highest literary award, The Order of the South. Previous recipients include Eudora Welty, James Dickey, and Reynolds Price. In 1996 he was named a Florida Ambassador of the Arts, an honor given each year by the state of Florida to someone who has made significant contributions to Florida's cultural growth. In 1999 Smith was inducted into the Florida Artists Hall of Fame, which is the highest and most prestigious cultural honor the state bestows upon an individual artist. Prior inductees include writers Marjorie Kinnan Rawlings, Zora Neale Hurston, and Ernest Hemingway. In October 1990 he received the University of Mississippi’s Distinguished Alumni Award and was inducted into the University’s Alumni Hall of Fame. In 1997, the Florida Historical Society created a new annual award, the Patrick D. Smith Florida Literature Award, in his honor. Thousands of people of all ages have enjoyed his books and his talks. With his new DVD, A Sense of Place, you can spend an intimate hour with this soft-spoken author and gain an insight into the creative processes that resulted in his beloved books.